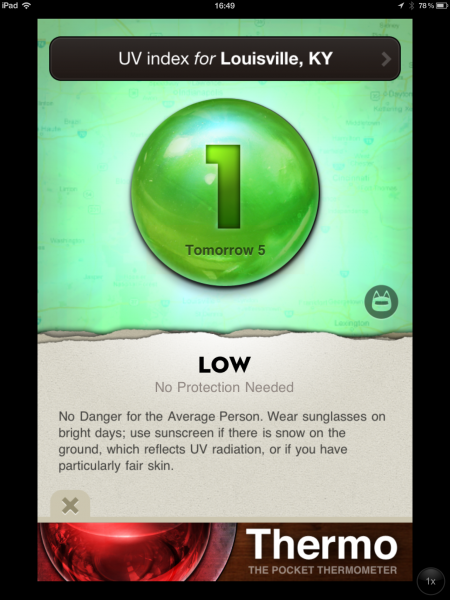 Can this app help individuals use the UV Index to improve sun protection in any geographic location? Can Ultraviolet be recommended as a professional app to patients. Robocat has developed this very simple and visually appealing app using GPS that is able to locate the user and inform them of the UV index of that specific day and the next. It also gives educational input for sunscreen or other ways to protect oneself from UV rays if so indicated. 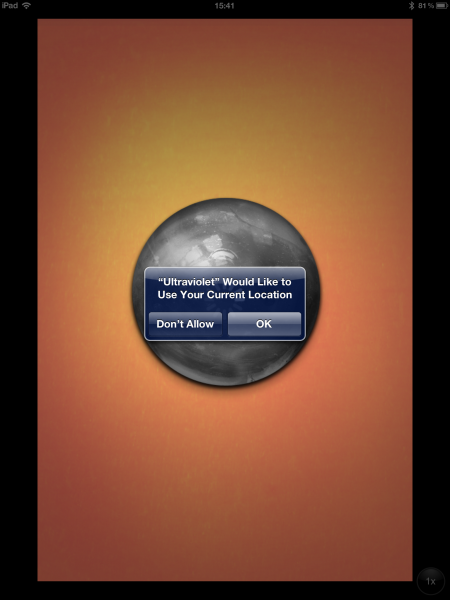 The opening page of the app requests permission to use location data. Once given, the screen indicates the UV Index and gives appropriate recommendations regarding sun protection. Exposure to the sun increases the risk of skin cancer due to damage to the skin by UV rays. Knowing how “strong” the sun is, particularly in climates where the UV Rays can be quite high or for individuals of fair complexion who may need extra protection, is useful information. Because the UV Index (UVI) is poorly understood and rarely used by the general population and smartphone app use by the public for health reasons is in its infancy, it is impossible to know if this app could have any impact on reducing sun-caused skin damage or improve understanding of the UVI by the general public. Has the potential, by its pleasing and easy interface, to increase awareness of the UV Index and the dangers of too much sun exposure. Patients with fair skin or increased risk of melanoma or other skin cancers. Robocat has developed a simple app, one click to the main screen. Cons–difficult to use the app to check travel locations, no general education area regarding sun exposure. This is a very simplistic app with one goal–to give the “average” user sun protection advice regarding the UV Index for which average is not defined. An education section in the app with its basic sun recommendations would be helpful to users, instead of listing recommendations only under the UV Index number. Unfortunately no references are cited as to how the app makes its recommendations, so useful as it is, it cannot be recommended for use by medical professionals. 1. Italia,N. Health Educ Res. 2012 Apr;27(2):200-13. Epub 2011 Jul 5. The app would also be useful for transplant patients (and any provider who deals with transplant patients); anti-rejection meds also significantly increase the risk of skin cancer.